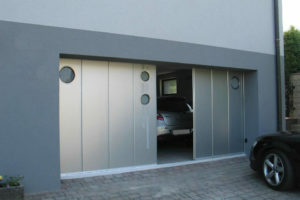 Side sliding garage doors. Traditional outside - modern inside. Forgotten vertical panel layout nowadays looks like new. In fact modern technologies reborn old and good design for new life. 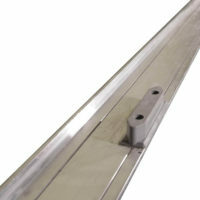 Door panels slide vertically suspended from a high performing aluminum top rail. 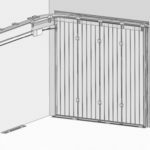 Consequently the guiding rail allow the door to pivot against the garages side wall. 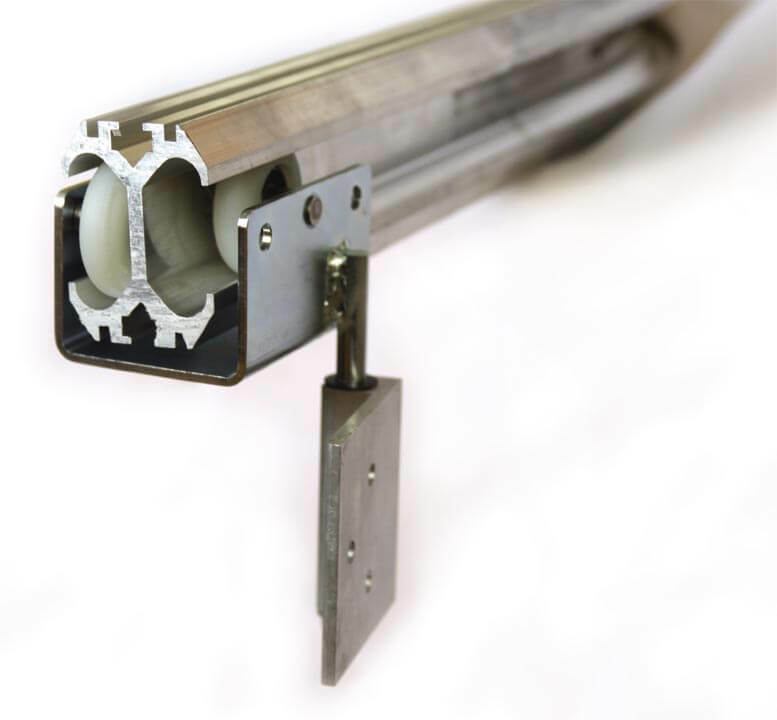 Special design guiding rail, trolleys and threshold ensure smooth and reliable operation. 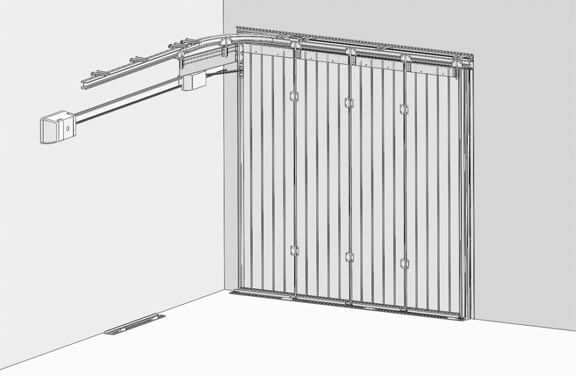 We manufacture side sliding garage doors from own made panels filled with Freon-free PU foam. As a result door have the best possible insulation. Also brush seals are all around the door perimeter. Above mentioned features give maximum available protection from the elements. 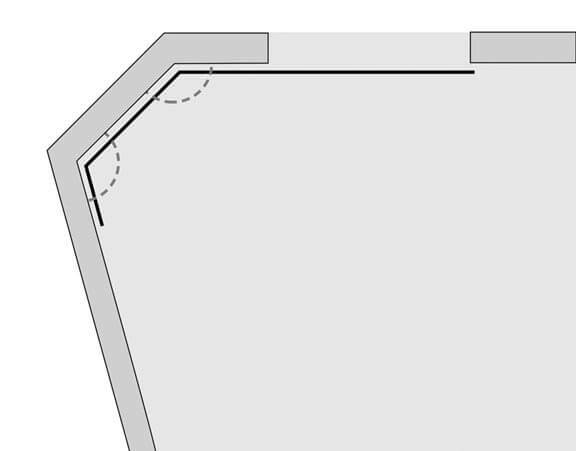 Standard is the right angle guiding rail corner. 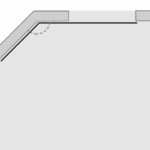 In addition we can make guiding rail with custom acute and obtuse angle corners. 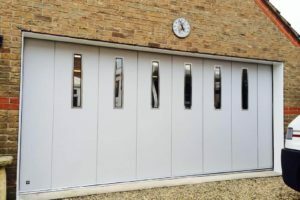 No doubt Side sliding garage doors rightfully deserve their name for nice and smooth motion. 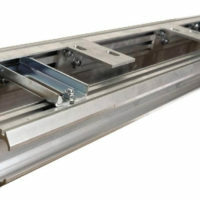 Ryterna side sliding doors can open to either side. Also for wider projects we recommend to part in two. For this reason this is known as ‘Bi-Parting’ garage doors. You can split the door in two even parts. Custom split also available. The only limitation – there must be at least 3 panels on one side. It is about 1.5 metre wide. 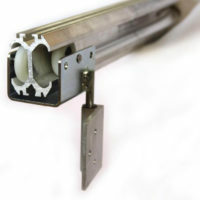 The high quality guiding rail is both heavy duty and maintenance free. We mount threshold profile on top of the floor. And car-friendly threshold is only 18 mm high. In fact threshold profile is absolutely maintenance free. 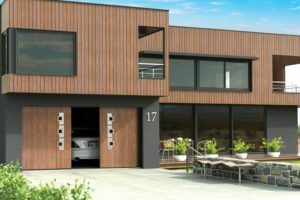 Ryterna make side sliding garage doors hardware from anodised aluminum and zinc plated steel. High quality trolleys with roller bearings ensure smooth and easy motion. 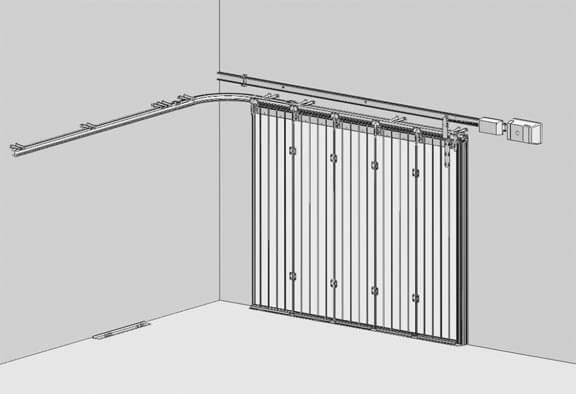 Therefore Ryterna side sliding garage doors have excellent performance and long service life. We manufacture custom size side sliding doors. One door has a maximum size of 6 metres wide by 3 metres high. 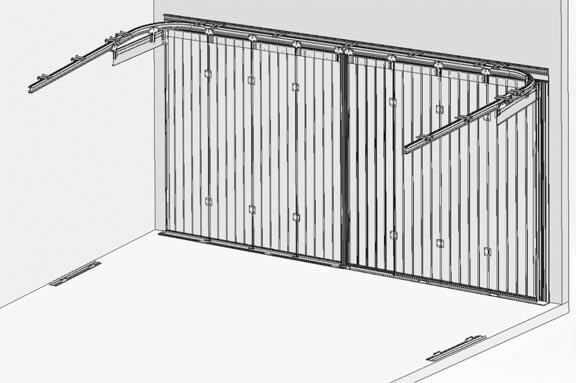 Actually we recommend to split in 2 bi-parting doors for openings wider than 5 metres. 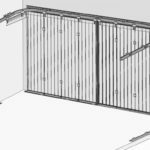 Please consult with us regarding extra wide openings – custom built doors could be a perfect solution in many hopeless situations. 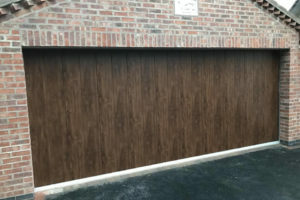 Side sliding garage doors go behind reveal. And that mean that there is no frame required. 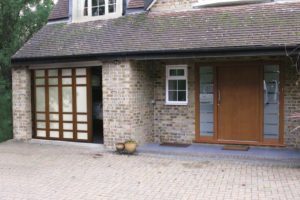 With sliding garage door you can retain full brick-to-brick daylight opening. 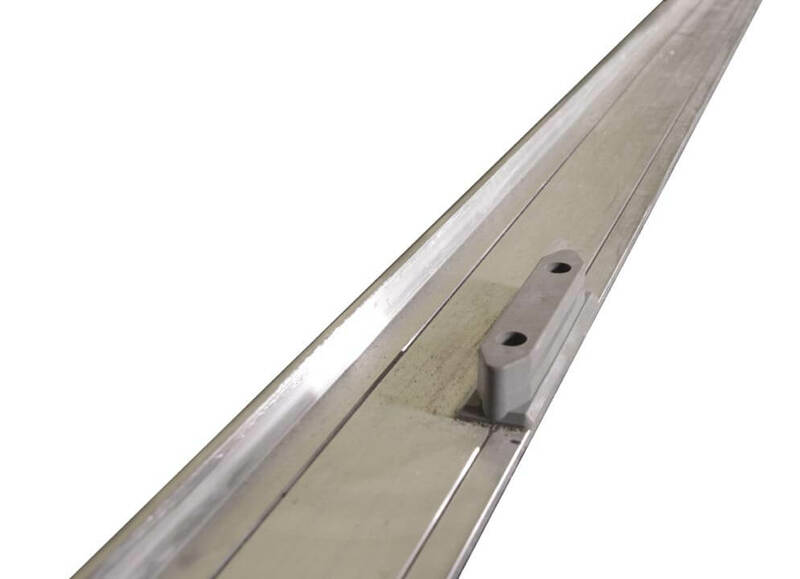 As a result Ryterna developed aluminium lintel profile and post system. Elegant, easy to install and maintenance free profiles are perfect solution. Furthermore aluminium profiles can be painted any colour to match garage door or house facade. We offer 14 panel designs which can be painted any RAL or BS colour. 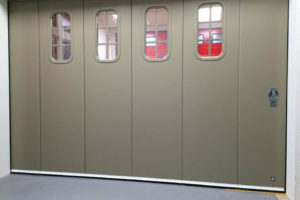 In addition, smooth surface panels can be painted with a metallic or structure finish. By combining different colour’s, door panels and stainless steel windows on one door can create an individually stunning design. In addition 6 wood effect panels can be specified to compliment any environment. In addition we offer individually designed Okoume & Alumax designs. Panels clad with 12 mm okoume plywood or 2.5 mm aluminium sheet. We can carve standard motifs and custom pictures. In this way we can recreate required door image. We also care about the inside of you garage door. Ryterna standard internal paint finish is RAL 9002 (Grey White). But almost any colour can be specified. Above all we can powder coat door hardware to match upon request. Glazed Panels are gaining popularity. 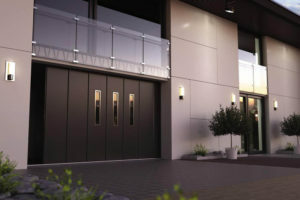 Ryterna can produce door with just the right amount of Glazing to suit your needs. You can order fully glazed door or combination of standard and glazed panels. Glazed doors are perfect choice for hobby space, workshop or vintage car garage. Café or shop owners install fully glazed sectional door instead of front window. As a result you can convert closed space in to the open within a minutes. For underground parkings we use ventilation panels. 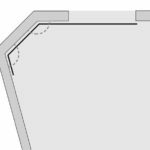 Ventilation panels ensure necessary air flow and perfect ventilation. Stainless steel & PVC windows are the most popular choice. 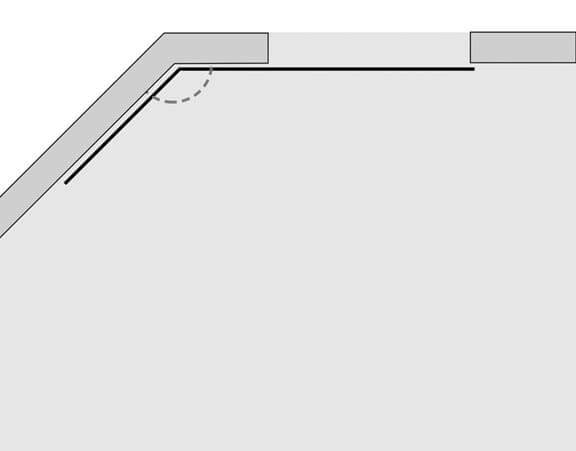 Ryterna have no standard window layouts. So you can decide on position, colour and glazing. Above all custom made shapes available. It’s as easy as design/sketch the layout you want and then consult on feasibility. The addition of windows, stainless steel decoration appliques or personal design options make Ryterna side sliding doors truly personal. 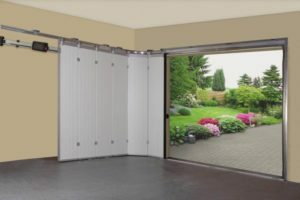 You can operate side sliding garage door manually or with electric operator. For bigger size doors and everyday use we recommend electric operation. 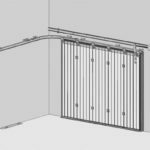 In fact side sliding garage doors have any counterbalance systems as sectional door do. As a result you will have to apply enough force to set in motion big door.